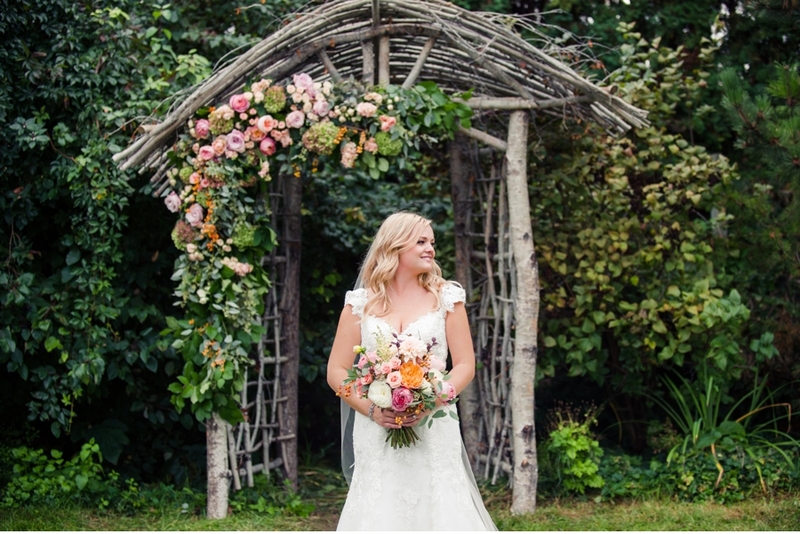 When I came across this floral arch I was transfixed...and then promptly swept off my feet and transported to the English countryside where I swear this wedding could have taken place. 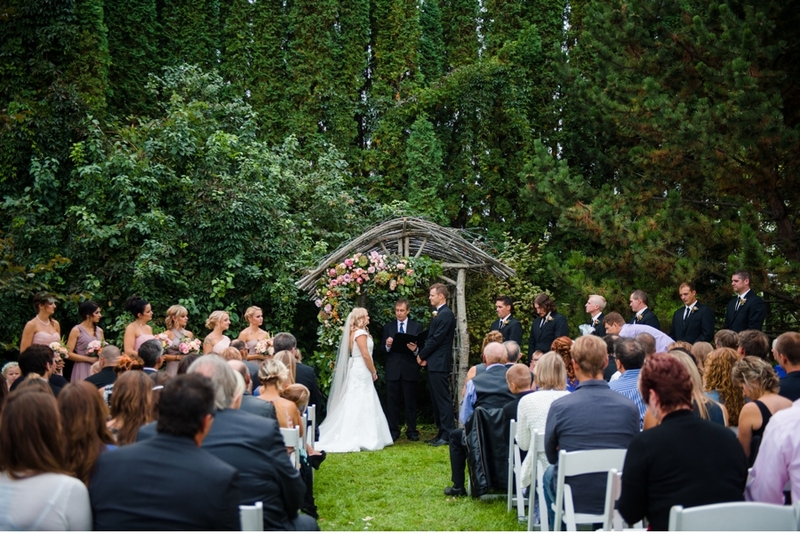 In fact, Kira and Brendon's September wedding took place in British Columbia's Okanagan Valley at Kelowna's Mission Creek Country Inn. Could have fooled me. 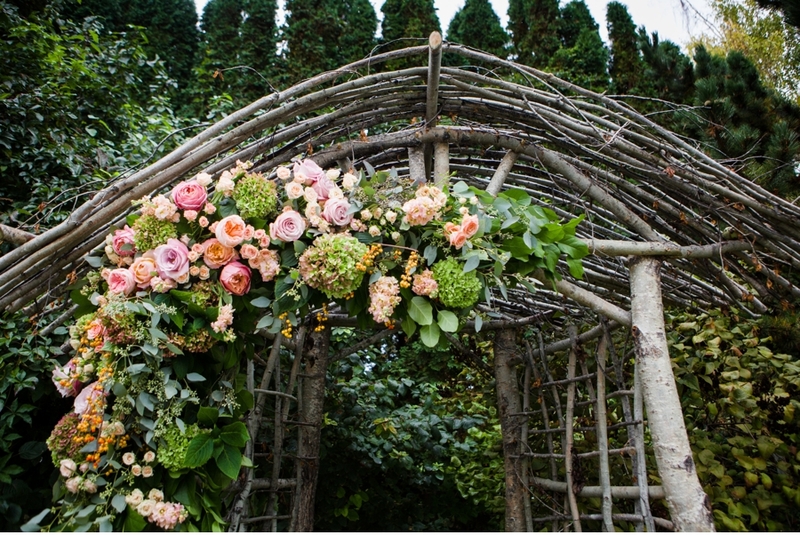 Designed by Okanagan creatives at A New Leaf Floral Design and Prime Creations, this garden arch with asymmetrical floral arrangement is one of the most successful (not to mention beautiful) wedding arches or backdrops I've ever seen. 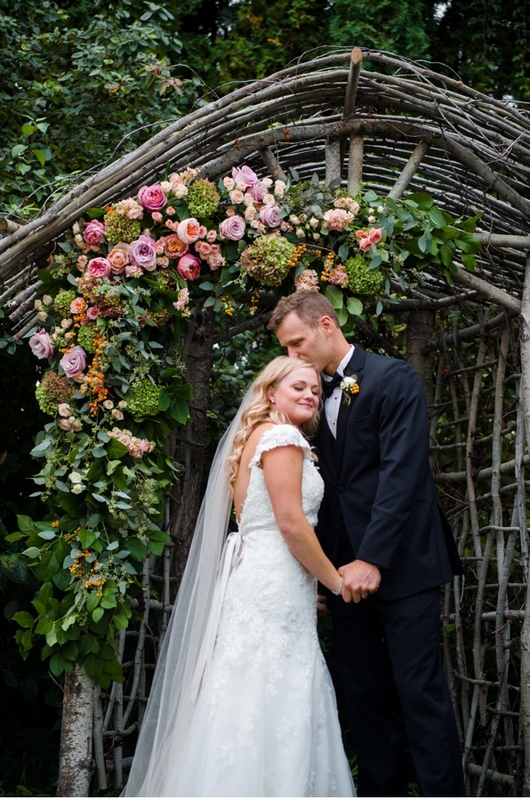 Backdrops and arches often contain elements that look as though they are sticking up out of the bride and groom's heads, or are so busy and distracting that they take away from the ceremony itself. 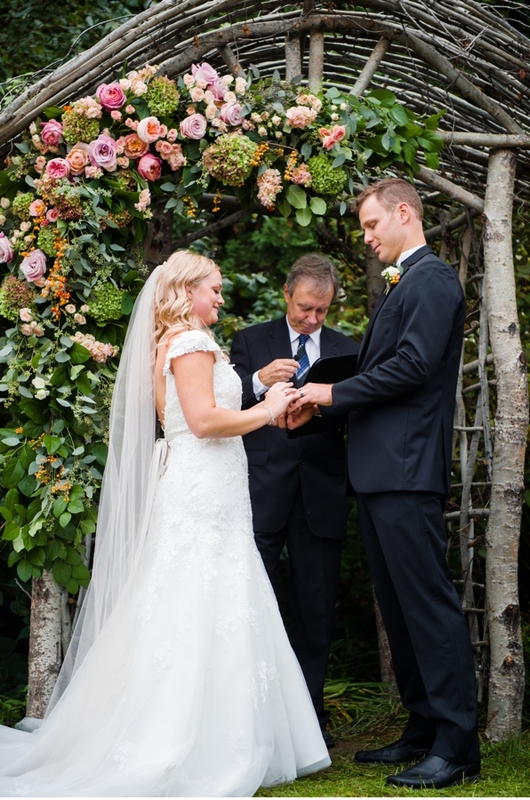 This arch, however, is perfectly constructed for this couple who has a distinct difference in height--the groom, Brendon, stood on the right during the ceremony where there were few flowers to get in the way of his head and face, and Kira, the bride, stood on the left where the florals above her head ensured there was no empty space leaving the eye to wander. Compositionally stunning. The depth of the structure really helps to draw the viewers eye all the way in to the centre of the scene and hold the focus. 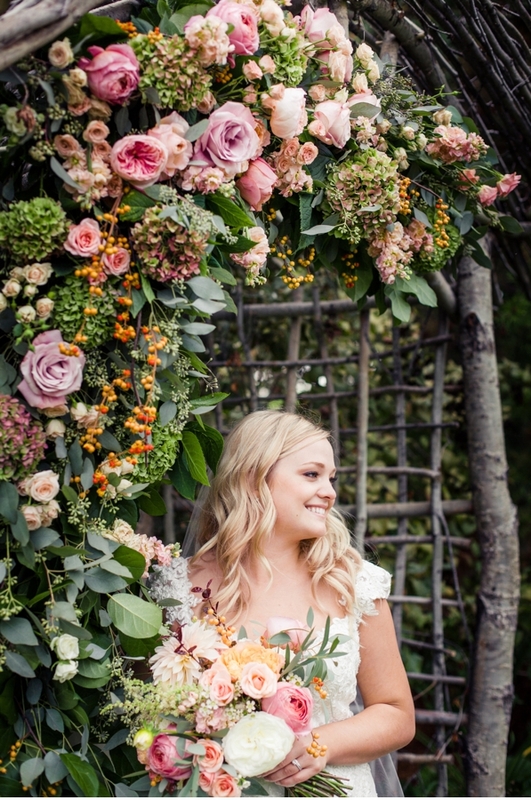 The combination of florals by Melinda Murovec at A New Leaf Floral Design includes café au lait dahlias, antique hydrangeas, and garden roses, all of which are at their peak in the Okanagan in September. One of the elements I love most about Melinda's process is that she grows some of her flowers with specific clients, like Kira, in mind. 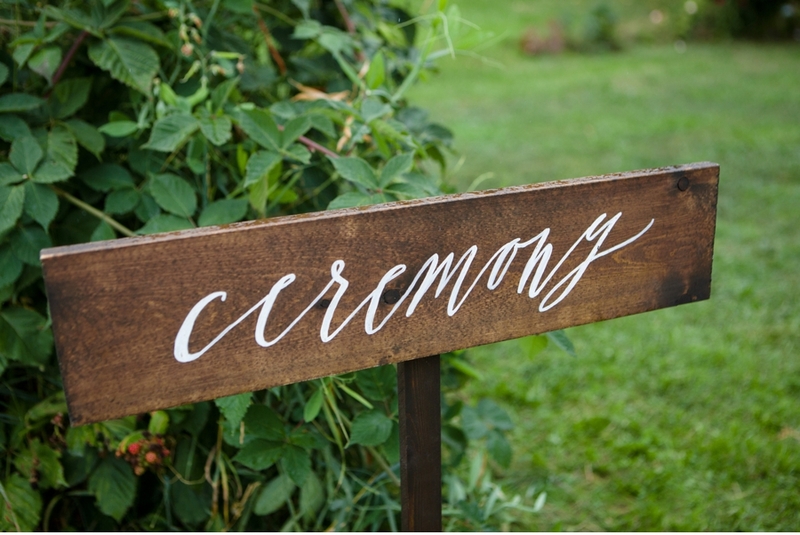 She actually draws 30-50% of her clients' florals (and most of the greenery) from her garden, depending on what is in bloom at the time of their event. What are Melinda's favourite varieties for September in Kelowna? Chocolate cosmos, along with the café au lait dahlias and antique hydrangeas she used in Kira and Brendon's wedding arch. 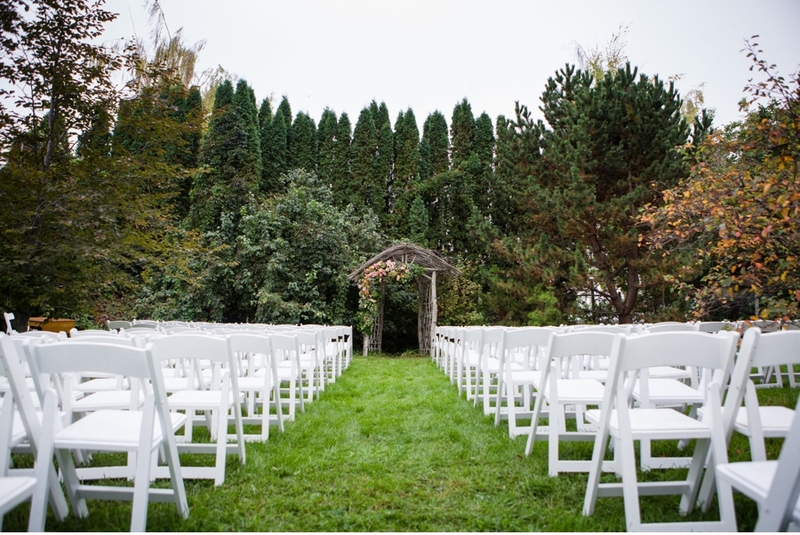 You'll definitely be seeing more on Vale + Vine from A New Leaf Floral Design, as well as many of the other vendors featured in Kira and Brendon's wedding.